Wow. 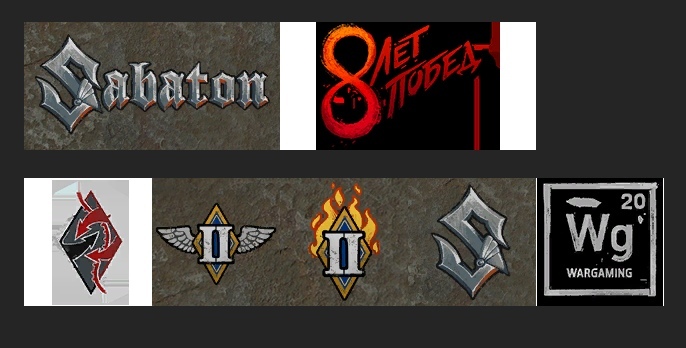 More Sabaton emblems. I can barely contain my joy. Some of Sabatons songs are nationalistic and xenophobic. Should not be a part of wot. you know I’m a nationalist myself right? not really, I’m a bigger fan of economic protectionist policies and land reform not forced industrialization. Only people with success get people who dislike them, so it’s fine. Sabaton is a swedish band and their songs are mostly about war stories and epic battles from history of different countries. What exactly is “nationalistic and xenophobic” there? Just asking. The song about the nazi SS soldier Lauri Toerni. First Toerni was SS then an Amerikan murderer in Vietnam. There are more glorifying war criminals in their songs. Was that guy epic? Yes he was, don’t see a problem with that. Besides, Sabaton usually emphasizes on bad aspect of war as well. Nice bit of commie propaganda/ disinformation…Lauri Toerni NEVER enlisted in the Waffen SS…he was a foreign student in a German officier school (run by Waffen SS),and had to wear the uniform of that school. Concerning the “murders” in Vietnam…he fougth the NVA / Viet Cong. His right to fight Soviets, the Russians still have Viipuri stolen to this day. Why WG never give us number emblem? It will be helpful in clan war, commander can call number instead of name!